"Padharo Sa Mhare Desh" (welcome to my land) is an apt title to describe the place and people of Rajasthan. Very warm and welcoming in nature, Rajasthan appeals to those who seek sand and sun. In the new years eve of 2014, a group of 5 in Mahindra Scorpio started their journey to Rajasthan. 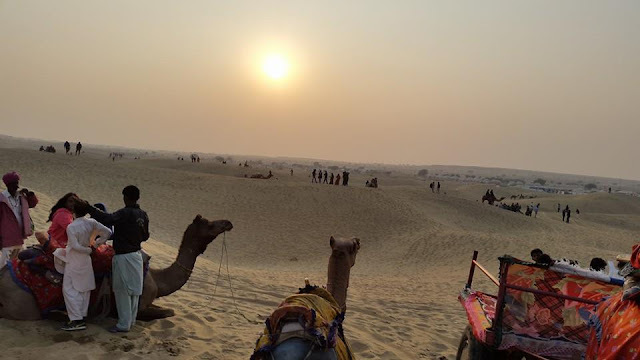 Our trip looked like Delhi-Faridabad-Jodhpur-Jaisalmer-Bikaner-Faridabad-Delhi. Wanting to not waste a day in travelling, at about 11pm our friends from Delhi picked us up from Faridabad for the first destination - Jodhpur! Driver 1 drove till 5am. Driver 2 by 9am took us to Jodhpur. We checked into The Blue Hotel Guest House. The hotel was definitely exquisite and exuberated royalty. It truly stood out for its name - Blue! Each room has a different size and interior. Needless to say the tariff varies. Since the owner is Jain, the food served is completely vegetarian. While the check-in procedure was going on, we were treated with complimentary tea and biscuits in their balcony. It really made us feel welcomed and refreshed us after the overnight drive. After a shower and little rest, we head out into the city. The first in the list was Jaswant Thada, built by Maharaja Sardar Singh of Jodhpur in 1899, is a beautiful place that is actually a cremation ground for the royals of Marwar. Attractions are the palace like structure, lake and gardens. Next we went to the Umaid Bhavan Palace. One of the most beautiful palaces in India, the Umaid Bhavan ironically is not very old because it was started in 1929 and completed in 1943. Currently owned by Maharaja Gaj Singh, the palace is named after his grandfather Maharaja Umaid Singh. We went into the Museum Section, one of the 3 parts of the Palace. The first is the residence of the still continuing generations of the royals and the second is turned into a luxury stay run by the Taj Hotels. The artifacts displayed were absolutely wonderful and gave the museum visitors a peek into how and what living like King feels. I couldn't help but take so many pictures of the display, from dining to tea sets, dressing table, variety of clocks, and so many things. One has to visit to see them. There is a model encased in glass of the Palace's architecture. What is interesting is the detailing done in making and replicating the actual Palace. A security person guarding the model when asked gladly explained which corner/section caters to whom. A corridor is dedicated to the actual photographs not paintings of the royal family members. Third in the list of day 1 was the Mehrangarh Fort. Built in 1460, this fort was initiated by a Rathore named Rao Jodha. Apart from the scenic beauty that this fort offers, the fort also a museum. But what really caught our attention was a sport - Flying Fox. 4-6 ziplines carried one person at a time high above the fort walls. 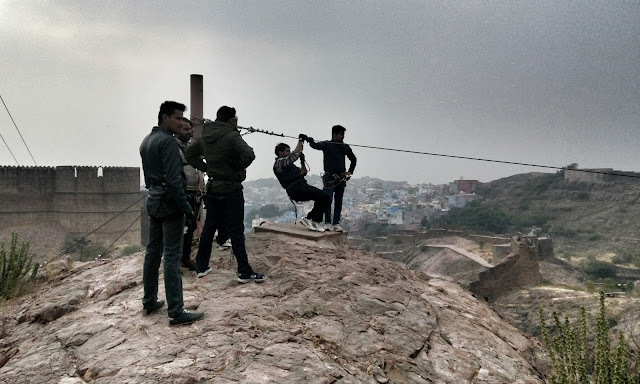 At about 1800 INR per person, Flying Fox was adventurous, scary and worth it. Almost tired, the last thing in our itinerary was a Village Safari. In 500 INR per person, the tour in the Kankani Village encompassed the complete drive in a heritage jeep, visiting huts and its residents, pottery making, tie dye, etc. The village is famous for the yet to be closed Black Buck Poaching Case in which an Indian film actor is involved since 1998. It was late evening and all we could think of is going back to our hotel for a good dinner and sleep. Especially the boys who drove last night without a blink. And that was a good night. My first and last night at the Blue Hotel. Tomorrow is check-out. After breakfast from the Blue Hotel, we started for Jaisalmer. Time Taken: 5 hrs approx. The road was very smooth with sand on both sides and frequent spotting of camels, the proud Ship of the Dessert! We took one halt for stretching our legs, tea and snacks. We checked into the Hotel Jaisalmer Palace. The view from hotel's terrace/dining hall. Our rooms were well lit and spacious. The attraction was the Window Seat. 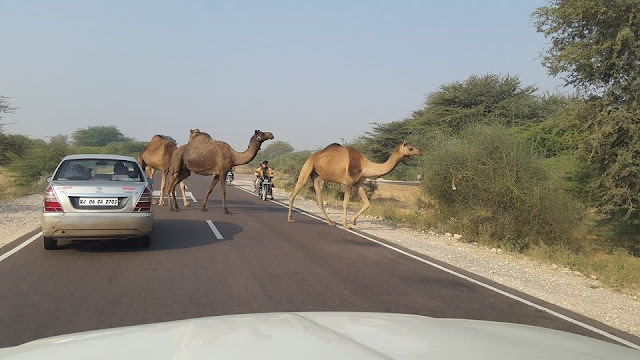 After some tea and snacks we went out to experience the quintessential dessert safari, both camel and jeep! The road leading to the Sam Sand Dunes was exactly how a dessert looks like. These decorated camels excited us for a ride and we first went for Camel Safari. Next was the Jeep Safari. It was crazy and thrilling. The dessert itself took away our whole day. Extremely tired, we returned back to our hotel. I and my husband are early risers on every holiday and we went straight for the terrace at about 6:30am. And we were greeted by the sight of Jaisalmer Fort or fondly called Shonar Kella (the golden fortress). We visited this fort as well the Jain Temple that is built inside it. The fort is very large and we couldn't cover it all that day. Inside the Jain Temple. Extremely intricate carvings on the marble ceilings and columns. The Jaisalmer Fort also has a museum. View of the city from the Fort. From here we head out to Bikaner. Time Taken: 6 hours approx. In Bikaner, we visited a temple that is famous for Rats! Yes, a temple wherein people and pundits lay out sweets as Prasad for the rats and they roam freely in hundreds all over the temple floor. After a night stay in a not-so-good hotel, we began our journey back to home. The Rajasthan Trip was truly memorable. Both the hotels we experienced in Jodhpur and Jaisalmer were awesome. The owner/manager, waiters, helpers, etc. were courteous and made sure that our stay was pleasurable. The sightseeing was worth the tiredness incurred later. The best commute we chose was the local auto/rickshaw. Our car was always parked in the hotel parking lot because the narrow lanes and unknown directions would have created unnecessary hassles. The food was majorly vegetarian but we did manage to get some tasty non-vegetarian dishes as well. The mutton dish called Lal Maas is a must try. The weather best suited us. From 31st December to 3 January, weather-wise we encountered no issues. The evenings and nights were chilly but day was sunny and bright. Rajasthan is a very hot state of India and it is never advisable to visit a dessert in the summer months like May, June, July, August, etc. It is considered off-season during these months. Colder months are better. With memories of the sand and sun, I hope to make many more visits to the cities of Rajasthan. 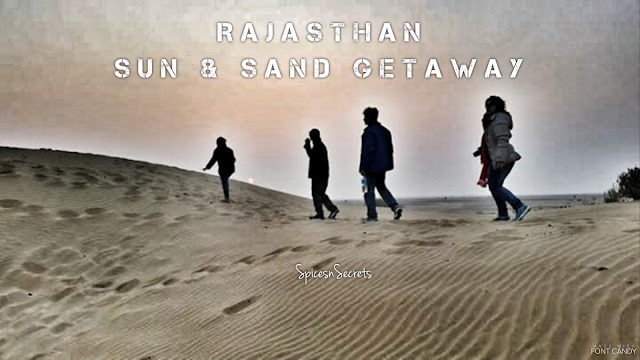 *Click to know the ULTIMATE SURVIVAL KIT FOR DESERT for my the 10 essential items in your baggage.